When you are reading or learning a Word file. You may want to make some notes. Maybe integrate some local disk image, audio or video or online resources such as YouTube video etc. into your notes can make it better. Even if you have Word processor installed, it cannot help. Because it cannot integrate multimedia based notes. When you are approving or releasing electronic documents, you'll add your comments and digital signature, but you cannot change the original files, which is the basic requirements for electronic documents management. Because if you change the file when approve or release, how do you prove that the error was not caused by your signature in the future. This is a particularity of electronic documents management from paper documents management. If cannot resolve the problem - Sign the file and without changing the file, the paperless office is just empty talk. The review and digital sign features nested in Microsoft Office Word and Adobe PDF will always change the file. If you don't believe it, you can ask yourself a simple question, where your comments, reviews and signatures go. 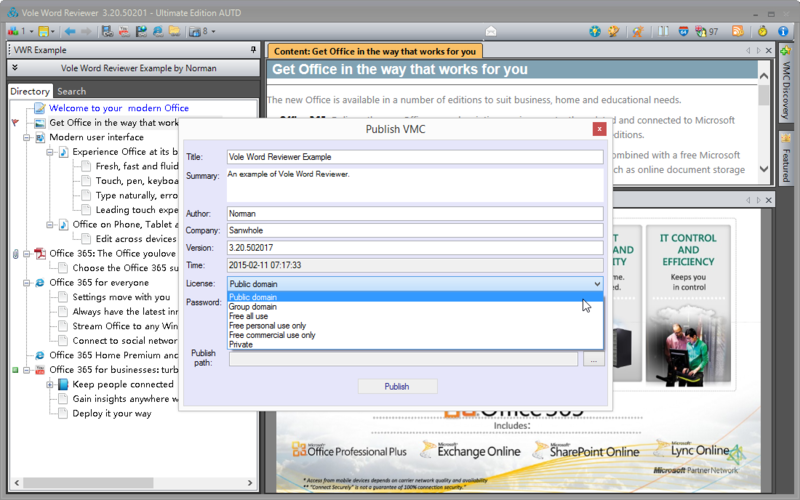 Vole Word Review lets you view, note, review and digital sign Microsoft Office Word doc without changing the file and without Word process installed. The software separates user notes from the Word file when save, and combine them when display. Vole Word Reviewer integrates Microsoft Office Word document and user reviews, attachments and digital signatures into a single-file library - VMC multimedia library. Vole Word Reviewer analyzes the Word document and creates reviews, preview attachments in built-in media player, manages digital signatures. Vole Word Reviewer never changes the original Word document. 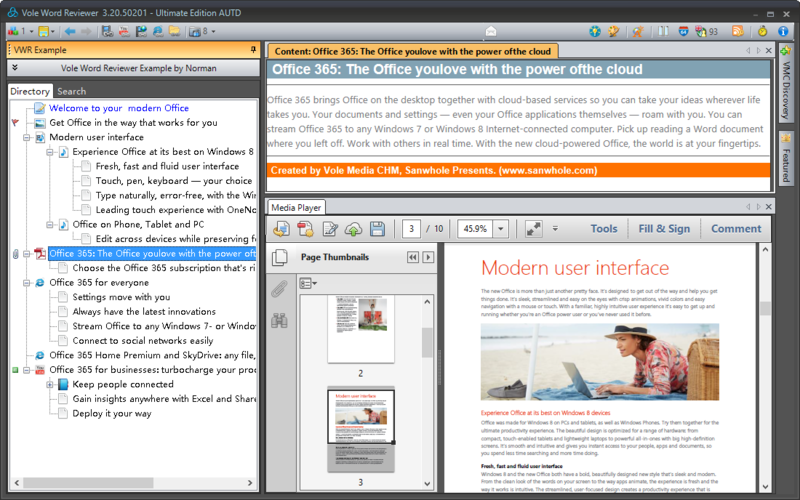 You can export the Word document and the attachments without any modification at any time. You can create a professional cover for the library. You can protect you library with password. You can publish your library with preset licenses. When you are reading or learning a Microsoft Office Word doc, you may want to write some notes for you or some comments for your staff. Reviewing the doc or printing out are not good ideas, because that will change the Word file or uneconomical. 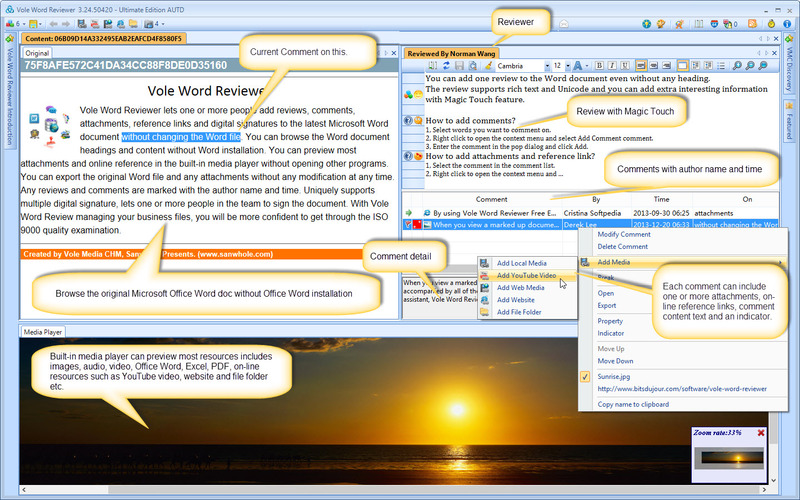 Vole Word Reviewer lets you create reviews for each heading line or for the whole Word document and shows the original Word document content and user reviews in parallel window and display the rich text notes and preview the attachment synchronously. 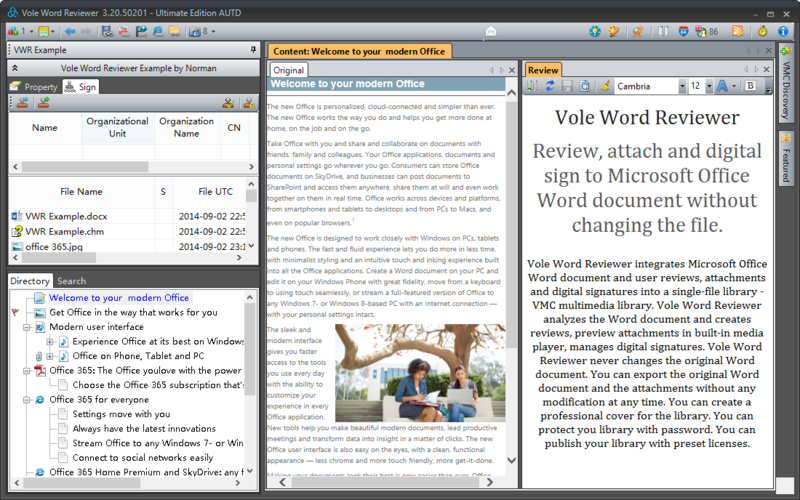 Vole Word Reviewer supports standard rich text reviews, you can change text size, font, color, etc. Magic Touch feature lets you add extra properties for each text line such as face icon, alarm message, etc. 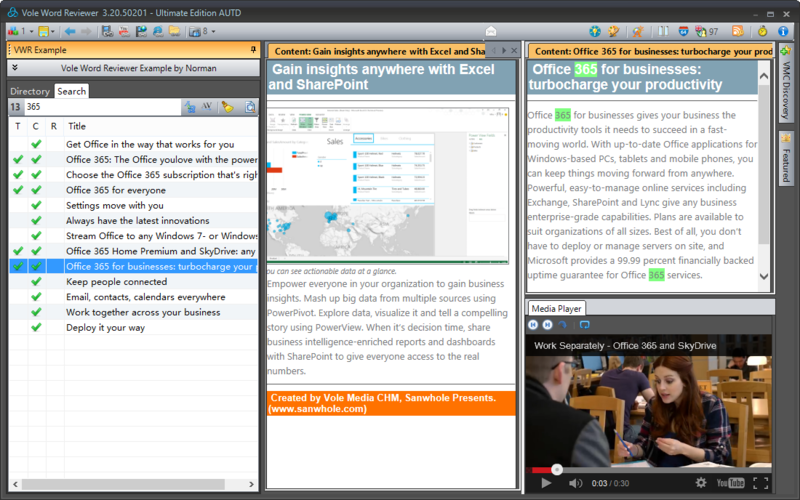 Add comment feature lets one or more people add comments on any content in Microsoft Office Word document. Each comment can integrate one or more attachment files, one or more online reference links and an indicator. All comments are marked with the author name and time. The attachments and the online reference resources can be previewed in the built-in media player synchronously. Add comment feature doesn't change the Word file, too. 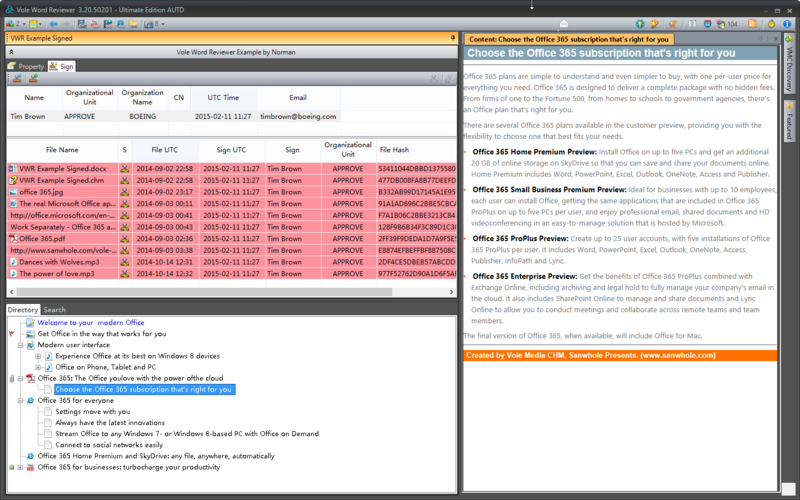 Vole Word Reviewer can attach local disk documents and online resources links to each Office Word document heading line - review node. The indicator in the head of the node shows you extra information, such as the linked documents amount, a flag from 30+ preset indicator collections. The node icon shows you the file type. Vole Word Review can attach any images, audio, video, any documents and link online images, audio, video, YouTube video and websites. Vole Word Reviewer supports PKCS #12 the most security digital signature. Vole Word Reviewer uniquely supports exclusive and non-exclusive digital signature lets one or more people of your team sign the same document. Vole Word Reviewer lest you lock each file via the unique 128-bit 32 bytes HASH value with ease. With Vole Word Reviewer you never be afraid that don't know which one is signed and which one doesn't before release. 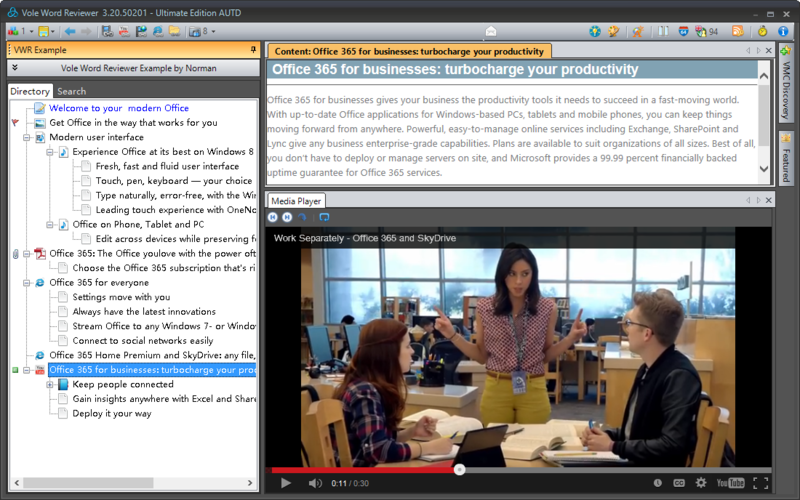 Vole Word Reviewer can preview a multiple files and online resources in the built-in media player. You don't have to open other program. The previewer supports any images, audio, video, Microsoft Word, Excel, PDF, CHM, VMC, RTF, TXT, SWF, GIF, HTM, HMT, YouTube video and websites. A professional library cover is very important especially for business. You can design a professional cover for your library. The cover will be displayed first when open the library. You can set a lot of properties in the library cover including title, company, author, version and time. You can adjust the properties display position, font, color etc. You can add a picture or gif animation for the library cover, too. Vole Word Reviewer search feature doesn't disturb your current work and shows search results in instant extended parallel window. And more, the search result window structure is same with its original edit window. So you can have bird eyes on the search results with ease. In addition to digital sign, Vole Word Reviewer can protect your VMC multimedia library with password. You can publish your library with preset licenses. Online: 762 ©2008-2019 - Powered by Sanwhole, all rights reserved - 3.92.9031.